What should you know about AutoCAD LT 2015? Why AutoCAD LT rental plans? Test results show that AutoCAD LT 2015 increases your productivity and saves you time. If a Desktop Subscription rental plan isn’t for you, you always have the option to purchase a license of AutoCAD LT or an LT Suite and add Maintenance Subscription to cost-effectively maintain and maximize your long-term investment. Learn how Desktop Subscription is the best way to access AutoCAD LT in this 90-second video. 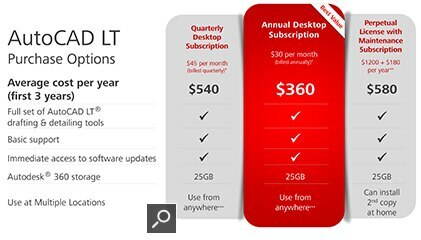 Learn the top four reasons why an AutoCAD LT subscription plan is right for you. See how Parisi Transportation Consulting uses AutoCAD LT Desktop Subscription to improve the reliability and safety of San Francisco street designs. See how customer Atelier Spina Architects keep their software up-to-date and their costs under control with AutoCAD LT Desktop Subscription. Still using an older version of AutoCAD LT? See what’s new with AutoCAD LT 2015. Questions about buying AutoCAD LT? See how customer Atelier Spina Architects keep their software up-to-date and their costs under control with an annual Desktop Subscription of AutoCAD LT. Still using an older release of AutoCAD LT? See what’s new with AutoCAD LT 2015. Privacy | Legal Notices & Trademarks | Report Noncompliance | Site Map | © 2017 Autodesk, Inc. All rights reserved. *Monthly value represents Autodesk SRP for the Autodesk product or service shown based on the purchase of an annual Desktop Subscription plan. Desktop Subscription plans are available directly from Autodesk or through Autodesk Authorized Resellers, and may not be available through all resellers or in all countries. The Suggested Retail Price (SRP) shown is Autodesk's suggested price for the specified product and services in the United States and Canada. The SRP does not include any allowance or provision for installation or taxes. The SRP is displayed for reference purposes only, as the actual retail price is determined by your reseller. Other terms and conditions may apply. **The average annual cost for the first 3 year of a perpetual license of AutoCAD LT software plus Maintenance Subscription is calculated as $1,200 cost for the software license plus ($180 Maintenance Subscription x 3 years) = $1,740/3 years. ***Desktop Subscription licenses can be used from anywhere as long as the license is purchased in the user's home country (and home country is not an Excluded Country). 1Autodesk LT Family Desktop Subscription Promotion offers customers three (3) additional months of use at no additional cost when contracting for annual Desktop Subscription of eligible Autodesk LT software products with basic or advanced support. Eligible Autodesk LT Desktop Subscription products are: Autodesk® AutoCAD LT® 2015, Autodesk® AutoCAD LT® for Mac 2015, AutoCAD® Revit LT™ Suite 2015, Autodesk® AutoCAD® Inventor LT™ Suite 2015, and Autodesk® Maya LT™ 2015. This offer is available on the purchase of qualifying annual Desktop Subscription products made from November 7, 2014 through January 23, 2015. Offer is available in the United States and Canada. Only Commercial customers and Government (Federal/State/Local) accounts may participate. Major Accounts are eligible to participate in this promotion, but cannot combine discounts with their major account discount. Educational licenses, upgrades, migrations, and education-to-commercial transfers do not qualify. This promotion is not valid for product licenses purchased through the Autodesk Employee Purchase Program. Offer available from participating resellers. Please consult your local Autodesk reseller for further details. Reseller prices may vary. Autodesk, AutoCAD, AutoCAD LT, Inventor LT, Revit LT, Maya LT and TrustedDWG are registered trademarks or trademarks of Autodesk, Inc., and/or its subsidiaries and/or affiliates in the USA and/or other countries. All other brand names, product names, or trademarks belong to their respective holders. Autodesk reserves the right to alter product and services offerings, and specifications and pricing at any time without notice, and is not responsible for typographical or graphical errors that may appear in this document. ©2017 Autodesk, Inc. All rights reserved.